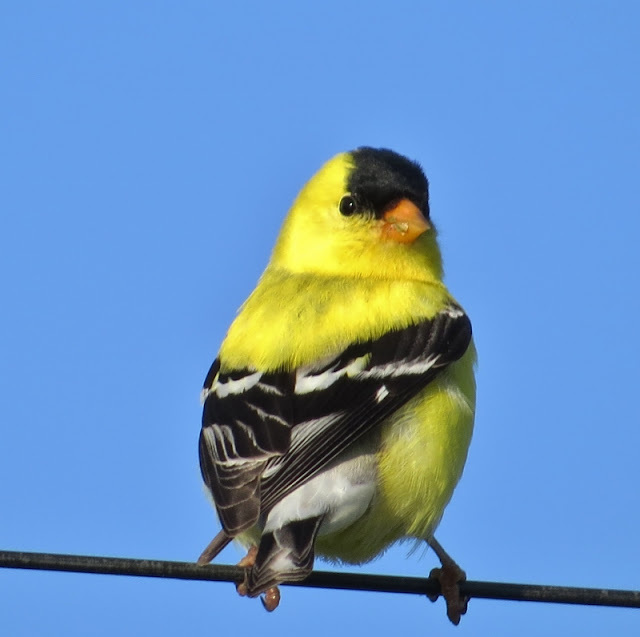 Other than people who curse at pigeons and gulls for making a mess on their freshly-washed cars I don't think there are many bird haters in Connecticut. Surprisingly, most of the negativity I've encountered have come people who have an overall interest in birds. 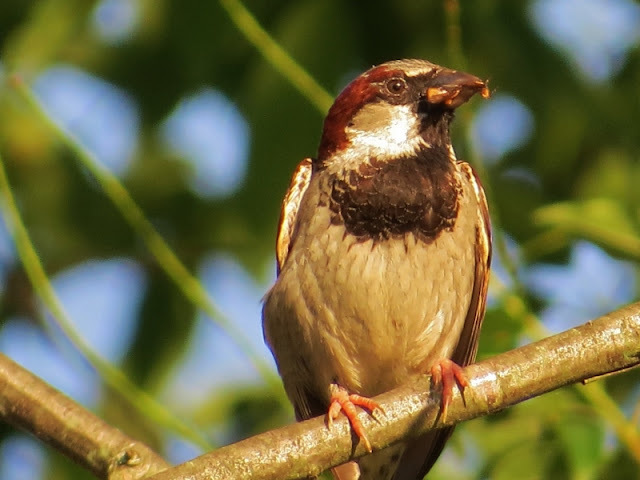 1) House Sparrow: House Sparrows are not native to North America. They were introduced species and many birders dislike them. They can be noisy and are known to overpopulate in areas near homes and businesses. There was a movement to build bluebird nestboxes to increase the population of the native Eastern Bluebird and House Sparrows seemed to move into many of these nestboxes. In some cases, those who tended to nestboxes would remove House Sparrows nests, eggs, and the birds themselves to help improve the chance to increase the numbers of nesting bluebirds. Why? Bluebirds are native, more well-behaved and prettier than House Sparrows. If the House Sparrow were the native bird and the bluebirds were introduced I wonder if they would get the same treatment? 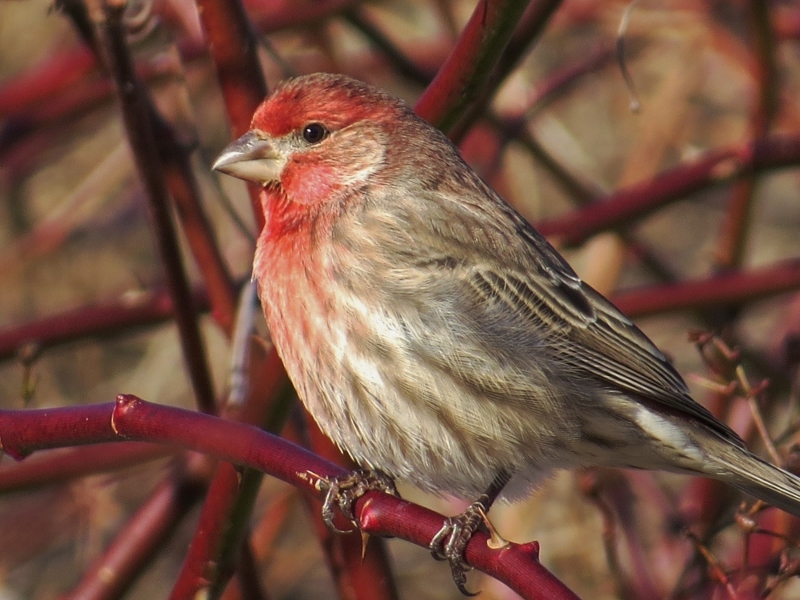 These days bluebirds are plentiful and the numbers of House Sparrows seems to have declined. I just see them as another species of bird doing their best to survive and were brought here by people. When they nest in my nestboxes I just leave them be. 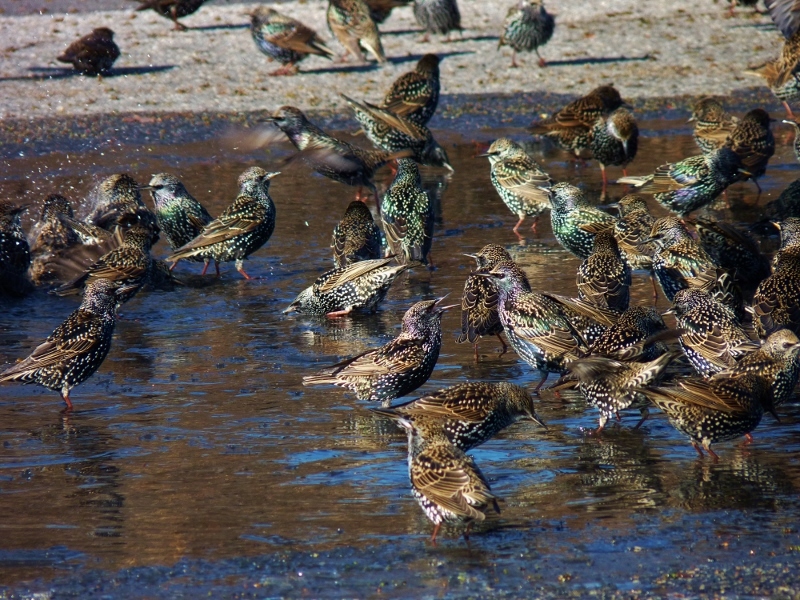 2) European Starling: The are also not native which is a strike against them.They flock in great numbers and do a lot of damage to fruit crops. I love the interesting noises they make and find it fascinating to watch their flight movements when they gather in huge flocks. 3)Mute Swans: They were brought here to decorate lakes and ponds. 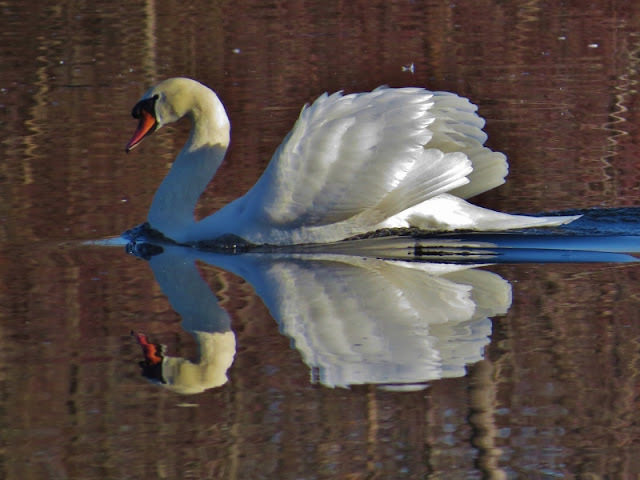 When they are nesting they can be aggressive and have been known to become a dominate presence on some bodies of water.Although birders have a negative view toward Mute Swans they are well-loved by many for their beauty. House Finches not wild but not Hated: I've haven't heard a lot of negativity directed toward house Finches even though their population started from birds that were released from pet store cages many years ago. 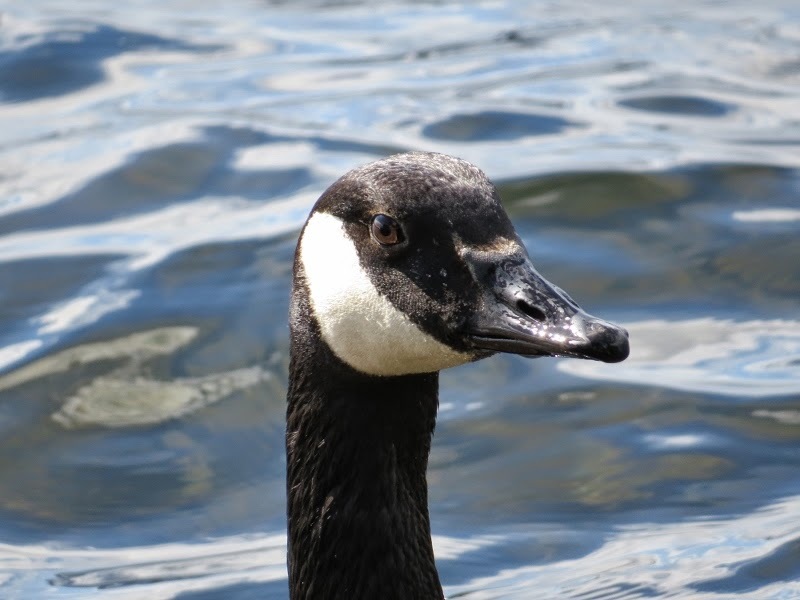 4) Canada Goose: For a time they were protected as a migratory species but then we figured out that they are here year round. Too many Canada Geese make a mess of a park pond which makes them unpopular to some. 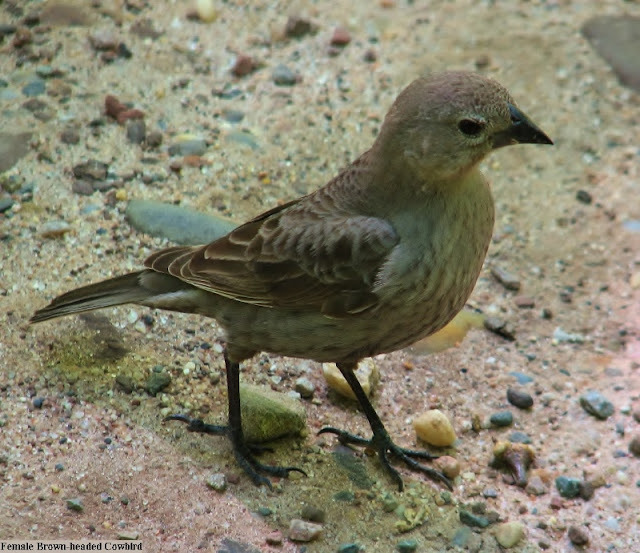 5) Brown-headed Cowbird: This species of bird is native to North America but they knock the eggs out of other birds nests and then lay their own eggs leaving other birds to raise their young. I once saw a baby cowbird in a Scarlet Tanager nest. It's kind of creepy, like a scene from the movie Invasion of The Body-Snatchers. I'm not going to say that these are my 5 favorite birds but I enjoy seeing all birds to some extent and have a hard time understanding how people can hate any birds. As they say, they're all God's creatures (although I have my doubts about mosquitoes). I see plenty of Kingfishers throughout the year. They have loud call and they're really conspicuous when perched on a branch. That is why it frustrates me so that I never seem to get a good picture of one. They fly off as soon as I think about touching my camera as though they know what I'm thinking. 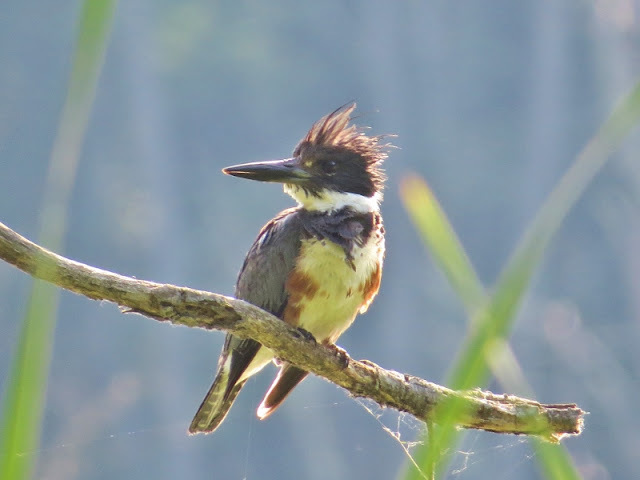 Maybe this Belted Kingfisher is a juvenile bird that doesn't have its street smarts yet. It stayed long enough for the photo although I was pointing right towards the sun. This is the second time I've found them at one particular powerline crossing. There were 2 adult birds this time and the last time I sighted them here there was a family of them. 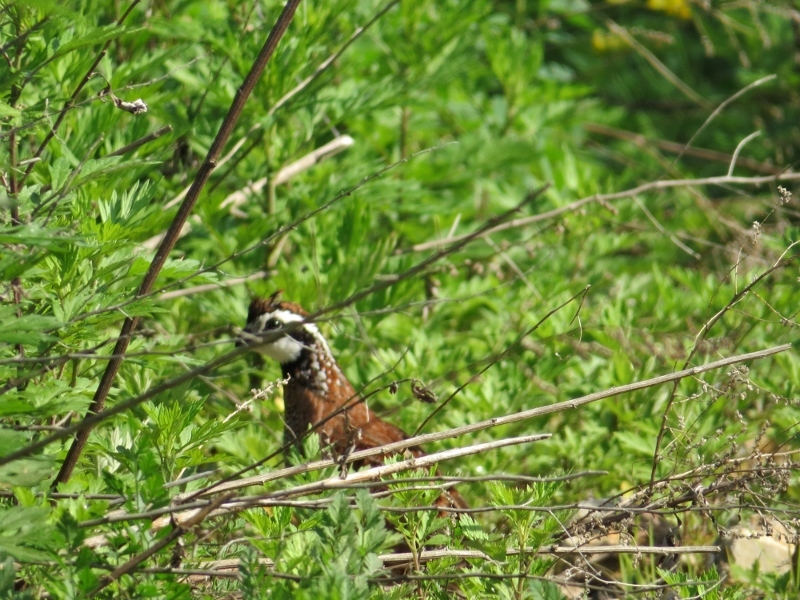 I've read that Northern Bobwhites are somewhat rare in Connecticut so I'm wondering if someone is raising them nearby and releasing them? Either way it was interesting to see them! This time of the year I continue to take short morning birdwalks hoping for an interesting sighting. On this particular day a friendly kingfisher and a couple of bobwhites made the morning worthwhile. I've heard quite a few birders say that they take a break from actively birding in the summer. They get a hangover from all that Spring migrant action and don't want to deal with summer birding conditions which includes too much heat, too many bugs, and too much foliage blocking the view. I don't quit birding in the summer but I'm much more laid back in the way I approach things. 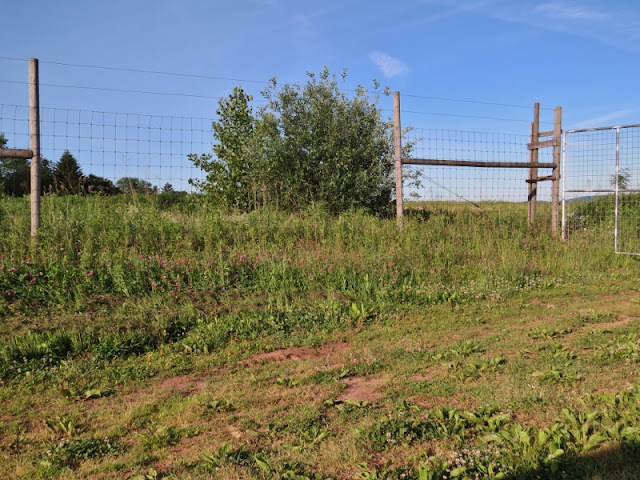 Recently I was just driving around looking for some sort of birding opportunity and found a weedy field with a wire fence around it. I sat in my car and watched as goldfinches,Song Sparrows, and other birds alternated between picking away at weeds and then perching on the conveniently located fence. 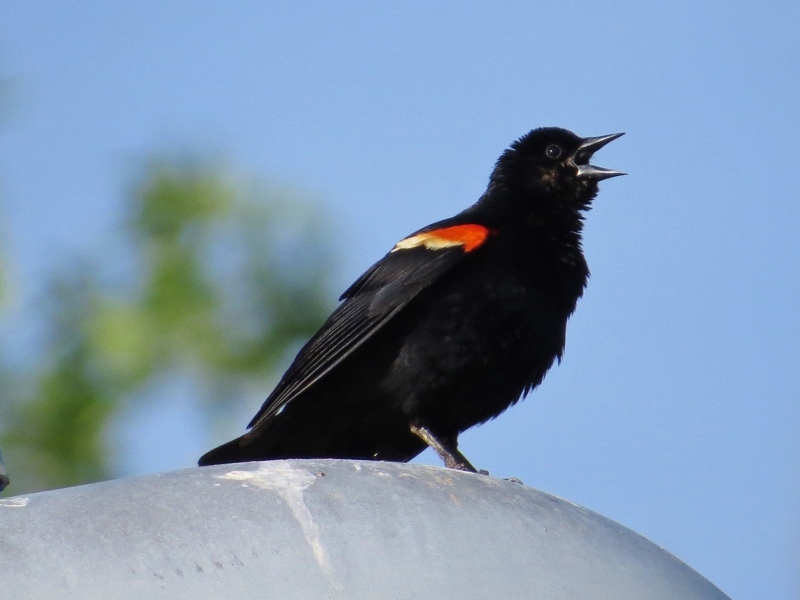 When I grew tired of watching birds on the fence I drove to the next field and waited for Red-winged Blackbirds to pop up on the light posts next to the fairgrounds. My biggest effort came when I actually got out of my car and walked 100 feet up along a local powerline path where birds were busy nesting. 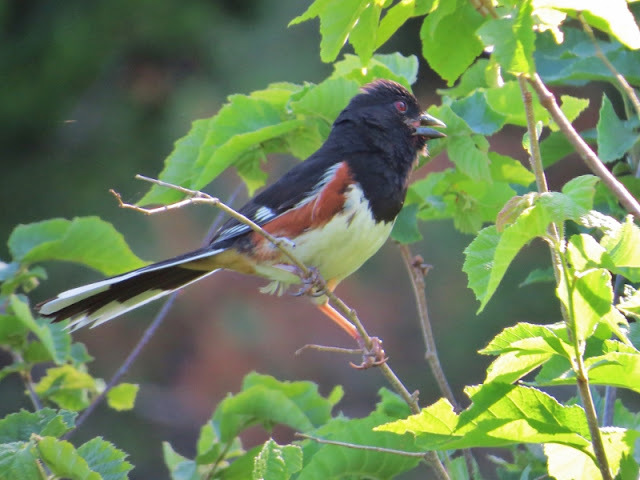 Towhees like this one occasionally hopped on top of shrubs to sing. 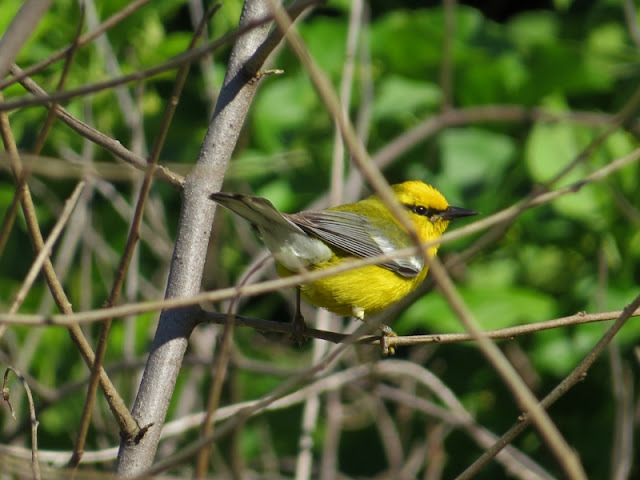 Blue-winged Warblers were a little sneakier but they usually landed on nearby branches before going back to the nest. One of the toughest parts of summer birding is actually being able to see the birds with all the leaves and vines blocking your view. Sometimes its just easier to find a spot where you know birds will eventually come into view instead of trying to outsmart them by crawling on your hands and knees through some poison ivy patch. I'll continue to look for the laziest birding opportunities possible this summer. In fact, I'm not even going to spellcheck this post.